As part of their public debate “Skills for Life: Scouting and Guiding – a cost effective answer” on 25 February 2015, the European Regions of the World Association of Girl Guides and Girl Scouts (WAGGGS) and the World Organization of the Scout Movement (WOSM) are presenting the outcome of a joint project on donor advocacy. In this framework the two Regions had gathered evidence from 19 National Scout Organizations of WOSM and Member Organisations of WAGGGS, together serving some 980.000 Scouts and Guides in 16 countries in Europe, about the challenges they face in raising funds to achieve their missions and the best practices around it. The resulting paper “Skills for life: Scouting and Guiding – a holistic solution” is an opportunity to raise and contribute the debate on the important role of non-formal education and youth movements, together with the increasing critical need to invest in education in order to fight unemployment and contrasting the detachment of young people from the political and democratic life. 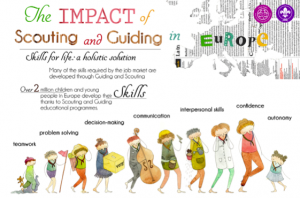 What is the impact of Scouting and Guiding on youth development, society and the economy? Is there any link between employability and volunteering in a Scout or Guide association? Several studies on the impact of Scouting and Guiding in Europe show that we have a very positive influence on youth employability, on society and on the economy – that is to say that if we think about education as a form of investment of society and individuals, Scout and Guide associations offer a high return on investment. Nonetheless one of the biggest challenges that Guide and Scout Associations face in Europe is access to sufficient funding and the right funding to cover the costs incurred to deliver life‐changing non‐formal education and volunteering opportunities for young people. Non-formal education providers like Scouting and Guiding associations continue investing in young people’s empowerment, skills development and active participation in the society at all levels. However, they have also been affected by the economic crisis and 21% of Guide and Scout associations in Europe struggled to attract sufficient income to cover their total annual operating costs in 2011-2013. On their current capacity to address financial needs, ensuring the full delivery of their educational programmes. Evidence from the European national Guide and Scout associations was gathered through an online questionnaire. On their successful experiences in attracting and securing the right funding. In particular research on the impact that Scouting and Guiding have on young people’s skills and the society have been identified as a best practice, thus studies of impact were collected and analysed. We are disseminating here the main findings with respect to the current European Agenda. This paper presents the main findings from the impact studies available in Europe and from the challenges that Scouting and Guiding associations face, and the practices developed. Impact studies have been identified as an effective tool to communicate with a variety of stakeholders, including potential donors, about the positive impact that Scouting and Guiding have on young people and the society. Manuela comes from Italy and she is supporting Regions work as Project Assistant in Safe from Harm project.